You can say that the jackfruit’s the jack of all fruits. The best part about jackfruit’s that everything is edible. Not just the fruit inside, but the seeds as well. It’s the world’s largest fruit, it grows on trees, and can weigh between 10 and 60 lbs. In some rare cases, a jackfruit can weigh up to 100 lbs. The fun part is that many people believe that the best part is the jackfruit seeds. There can between 100 and 500 seeds in a single fruit. They have an oval shape, and their size is similar to Brazil nut. You can’t eat jackfruit seeds raw; you must either boil or roast them. Their taste is like a fruity potato. But before we get to the how to cook part, let’s take a look at the nutritional value of the seeds. But more importantly, jackfruit seeds are rich in minerals and vitamins. The list includes B vitamins like riboflavin and thiamine, but also minerals like zinc, calcium, potassium, copper, iron, and manganese. All of these minerals have their own purpose in your health system. But we all know calcium is crucial for bone health, protein is crucial for your blood, and zinc helps with overall health. Last, but not least, the seeds of the largest fruit contain phytochemicals and antioxidants. Some of them, like polyphenols, for example, are extremely healthy and beneficial for you. Now that we know the nutritional value of jackfruit seeds, it’s time to learn how to cook them. The good news is that there are different ways to cook seeds. And once you cook them, their texture and flavor is similar to chestnuts, so think of them as a healthy snack. You can also add jackfruit seeds to curries and smoothies once cooked. If you want to boil them, put a cup of seeds into a large pot and cover them with water. You need about one inch of water above the seeds. Bring them to boil, reduce the heat, and simmer for 20 minutes. You’ll notice the seeds are ready when you can easily pierce them with a fork. Drain the water and place the seeds on a baking sheet. Let them cool and dry, and peel the outer white layer. What you want is the thin brown layer inside. If you want to roast the seeds in an oven, start by preheating the oven to 400F. Place the seeds on a baking sheet lined with aluminum foil. Bake for 20 minutes. Again, you can check if the seeds are ready by trying to pierce them with a fork. If it’s easy to pierce them, they’re ready. Let them cool down, and then peel the outer white layer. Last, but not least, you can roast them in a pan. Add them to a dry, cast iron skillet. Bring the skillet to medium to high heat, and then roast the seeds, shaking occasionally. Your seeds are ready when the skin is blistered and cracked. Take them off the heat and let them cool down. Peel off the outer layer and enjoy! Put all the ingredients, except the jackfruit seeds, in a food processor and blend. After a while, add the seeds. Continue blending until you get a smooth texture. If your hummus is dry, you can always add a tablespoon of water. When the hummus is ready, you can sprinkle some paprika on top of it. As I mentioned at the beginning, these seeds are extremely beneficial. There are many ways to use jackfruit seeds for your health. To combat wrinkles, you need some seeds dipped in cold milk. Let them stay in the milk for a while, and then grind them. Apply regularly on your wrinkles for four weeks to reduce their appearance. You can also use this treatment to get flawless skin within minutes; simply perform this treatment about 30 minutes before going out. In addition to helping with your skin, jackfruit seeds offer numerous benefits for your overall health. For starters, they are high in protein. If you want to add them to your regular diet, you can substitute jackfruit seeds for lentils. 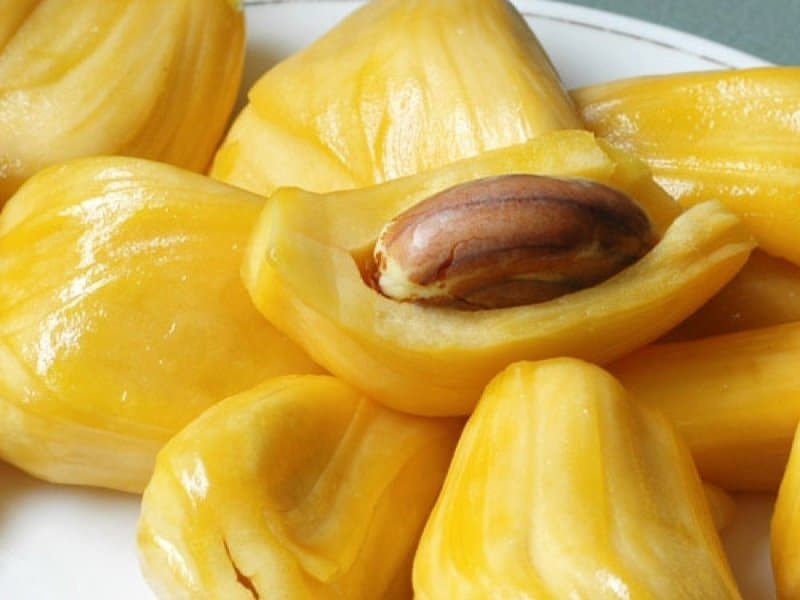 The biggest health benefit of consuming jackfruit seeds is in their anti-cancer nutrients. The seeds are rich in phytonutrients, which are known to have anti-cancer properties. Last, but not least, they help with digestion. By preventing indigestion, these seeds offer numerous health benefits. Indigestion can cause so many different problems, not just for your skin and hair, but for your overall health as well. Speaking of your hair, consuming these seeds will promote healthy blood circulation, which improves your hair growth. In addition, the seeds of this exotic fruit are high in vitamin A, the most important vitamin for good hair health. I have wondered about the Jack fruit, ever since I saw one at a local market, the attendant gave me a sample and I am hooked. I was wonder what the peak season is? Thank you so much for the information.